Based on what I saw driving past Green Lake on my way home from Ballard this afternoon, I’d say 90 percent of the Seattle population was outdoors today (and the other 10 percent was wishing it was). Never mind that the temps got up to only around the high 40s – this rain-soggy region had been craving sunshine! When I arrived at Hale’s Brewery for the Urban Sketchers Seattle meet-up before 11 a.m., the temperature wasn’t yet 40, but that sun was irresistible. I zipped up my down parka and sketched the scene outside Hale’s, where there were so many utility lines criss-crossing the street that I could hardly keep track of them all. 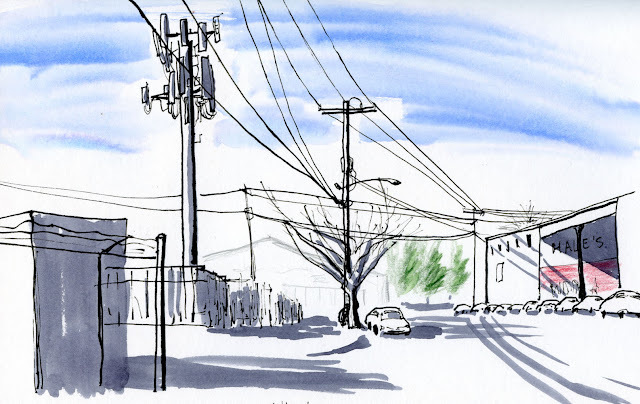 As I sketched, I kept thinking that I probably wouldn’t have attempted a composition spanning this much distance before taking Gabi’s Pocket Urban Sketching workshop last month. Although the concepts he taught about scaling weren’t new to me, I think it was the first time the proverbial light bulb had turned on over my head. 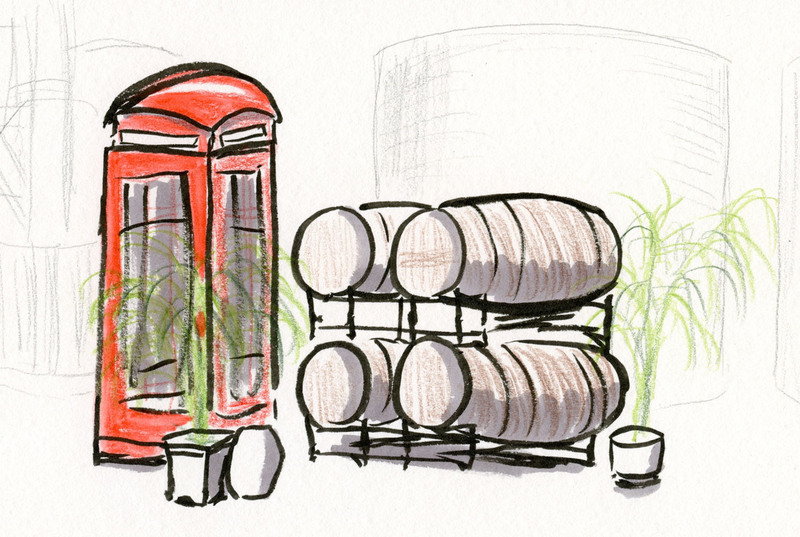 Thirty minutes later, my hands were cold, despite that delightful sun at my back, so I ducked inside the brewery to sketch the British telephone booth next to some barrels. 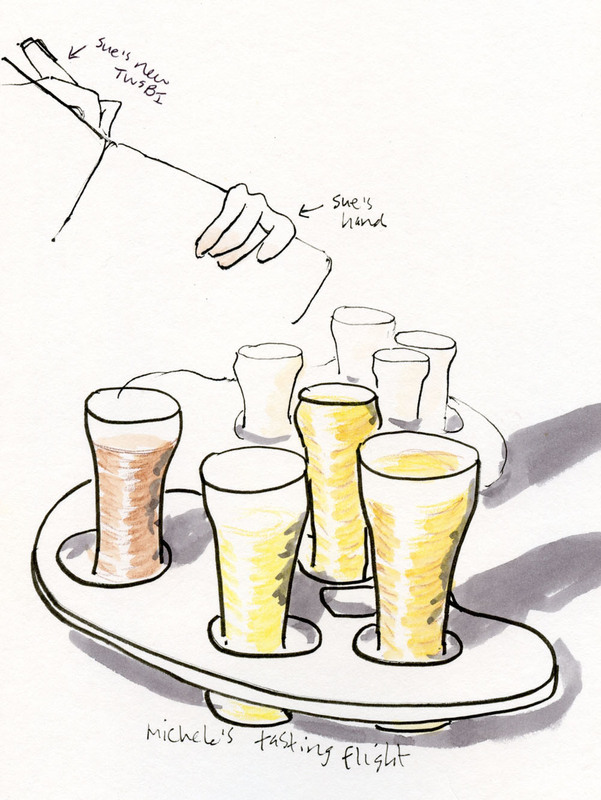 By then I was hungry, so I joined other sketchers for lunch inside the pub. 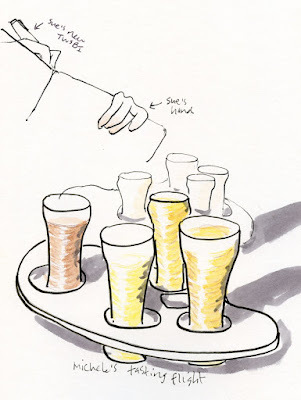 Michele and Sue each had a tasting flight of five brews that I had started to sketch. I didn’t get far on color or details, though, because then my Nightroll Stout (named for the Fremont Troll) and burger arrived (and you know me – I’ve never been one to let my food get cold for a sketch). Ahhh – a day like this could sustain me for the rest of winter! 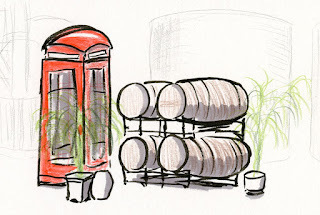 Good sketches. "The rest of winter" is, officially, just a day or so. But the weather will probably not see it that way.